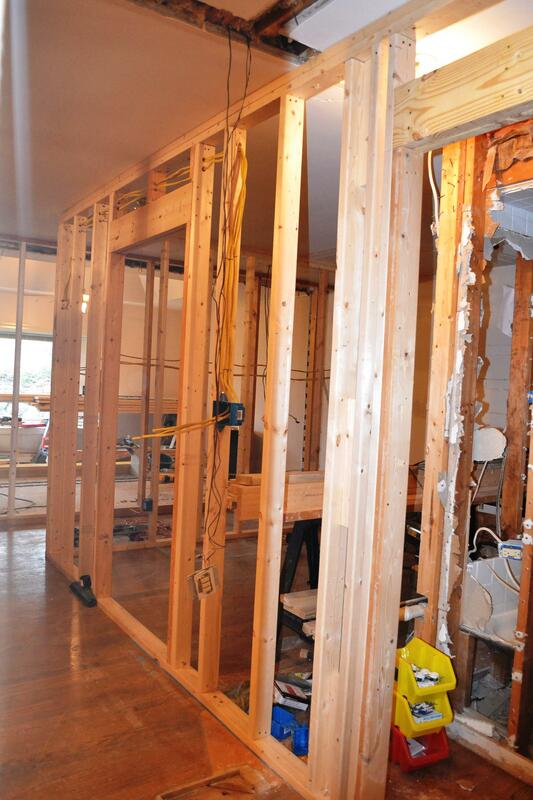 Not only am I referring to Ryan and all his friends that have helped in this remodel process, but I am also referring to the framing that’s been happening in Casa de Bauer! 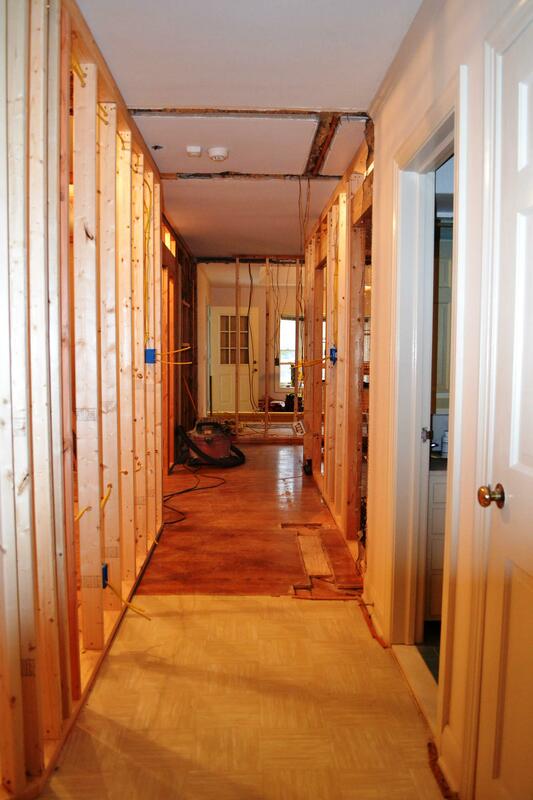 We are (almost) completely framed in the master, walk-in closet, and bathroom. 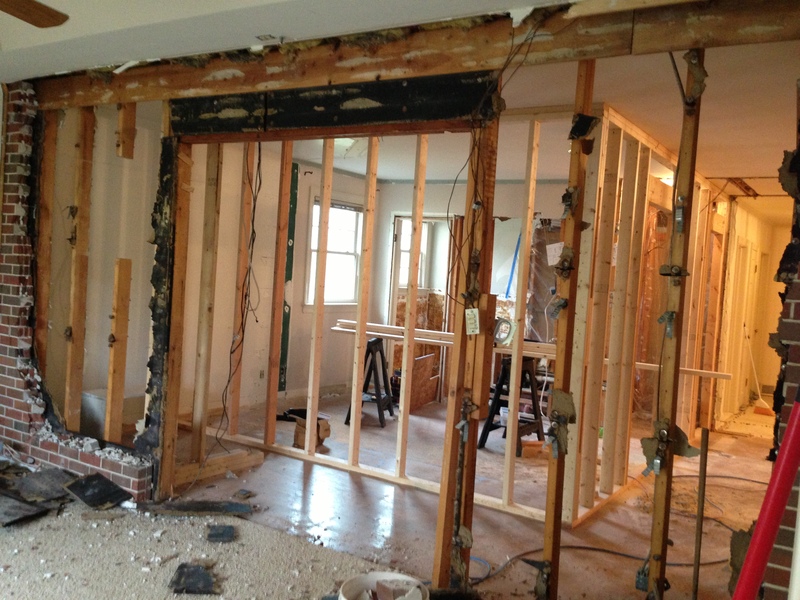 But before we got there, we had to knock out the walls so we could build new ones….makes sense, right? 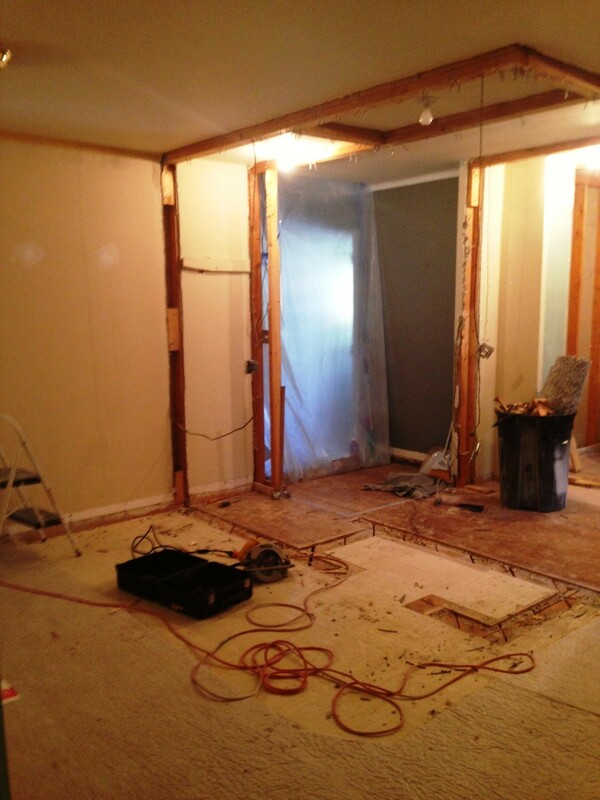 Ryan and I worked carefully around the electric to dismember what was left of the original six closets and hallways. I kept joking “it’s a good thing I’ve had a tetanus shot” because those 2×4’s were covered in countless rusty nails. Miraculously( Michelle = clumsy) I haven’t been stuck…but never say never! At first we tried to do the ‘green thing’ and remove the studs carefully so we could re-use the boards, but we decided we were spinning our wheels and wasting too much time just pulling out nails. 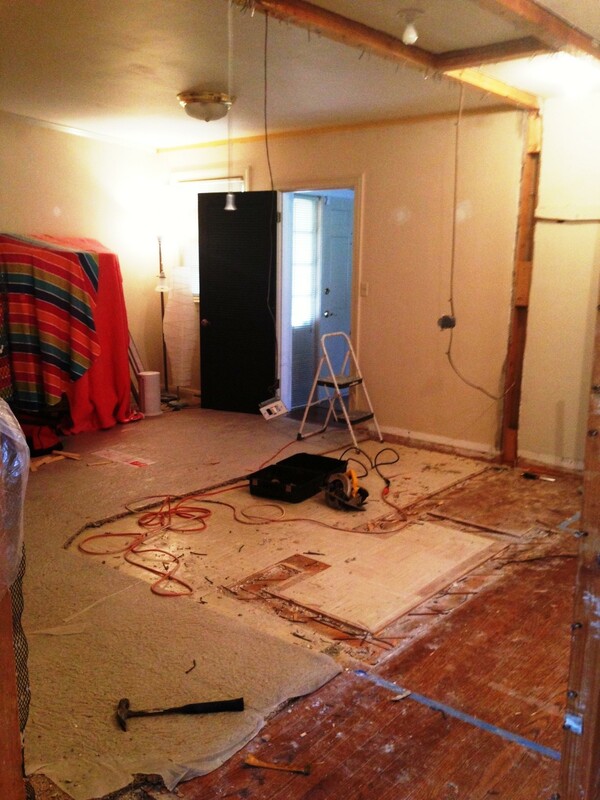 On the plus side, we did manage to save a good amount of studs before we started scraping them. When it was all said and done, we were left with a large empty space. While removing the carpet we uncovered old white (what looks to be asbestos) floor tile from 1960. Because we plan to lay carpet in this area we are not concerned the tile may be asbestos. It’s when you want to remove/break up the tile, that you have a problem. We are just going to cover it up, so bada bing, bada boom! Over the past few days we have been slowly chipping away at the brick load-bearing brick wall (mentioned here) in the existing master. We were offered help by two of our friends, so we of course we accepted. 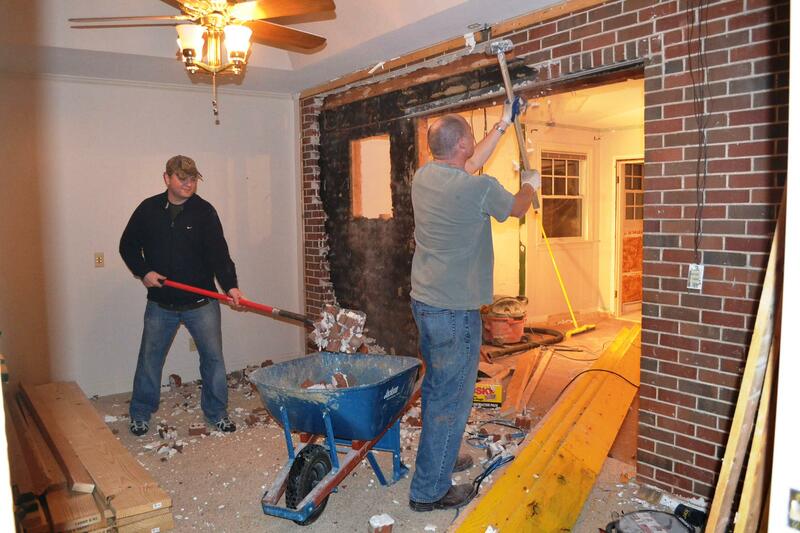 David swung the hammer while Brian shoveled the heavy debris into the wheel barrow. We are lucky enough to have a dumping area on our property so we didn’t have to pay for brick removal. The wall couldn’t be demo’d (is that a word?) in one night so Michelle was nominated to finish the job while Ryan began framing. I don’t think Ryan thought I had it in me, but I did pretty damn good if I do say myself! 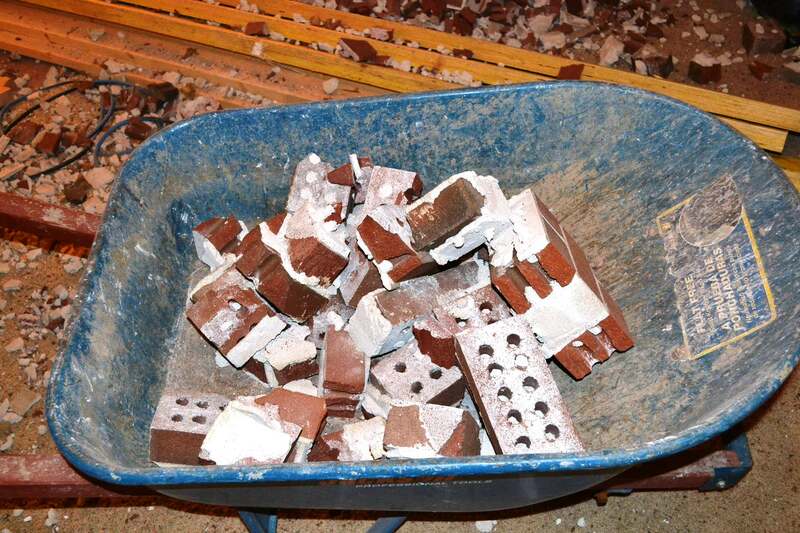 I removed the rest of the brick and moisture barrier on the right side. I was told to leave on the left side of the wall because that is technically the original exterior corner of the house and the brick was stacked differently. 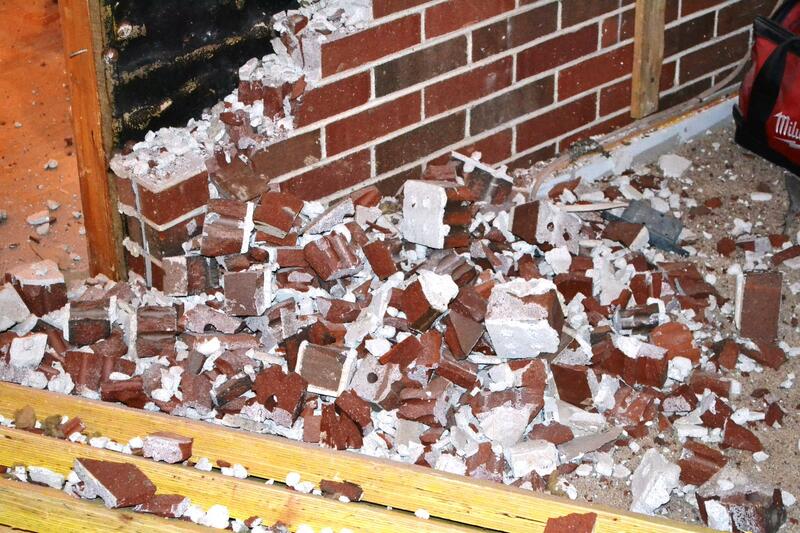 If I don’t get ‘guns’ (aka arm muscles) from swinging a 16 lbs sledge hammer into brick, I don’t know how I will. But anywho, while I worked at growing my biceps, Ryan and Al (the carpenter we hired to help us post-demo) got into a groove framing out the space. 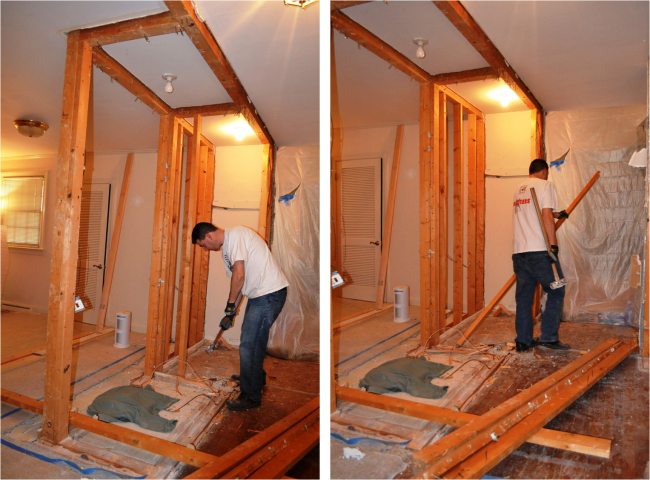 In less than a Saturday afternoon the whole room was almost completely framed out…woohoo! 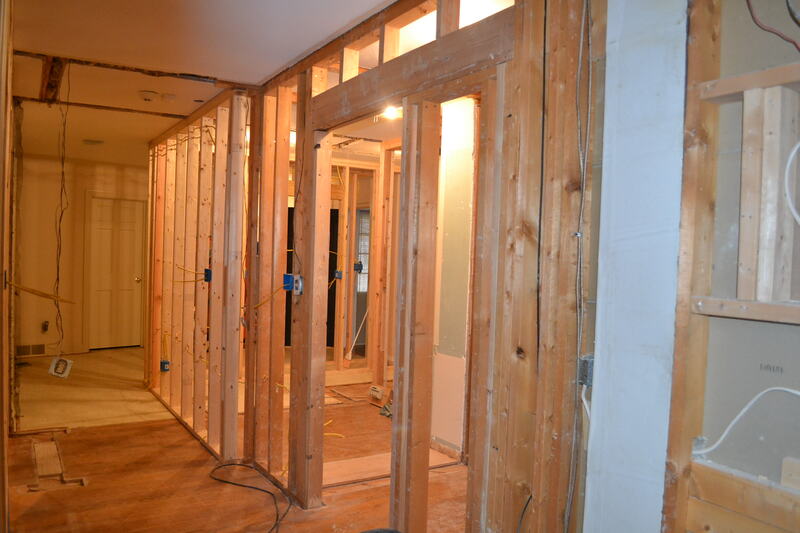 *Excitedly* I announce, we now have a framed hallway, walk-in closet, and bathroom.. I won’t lie, I may have let out a squeal or two in excitement. 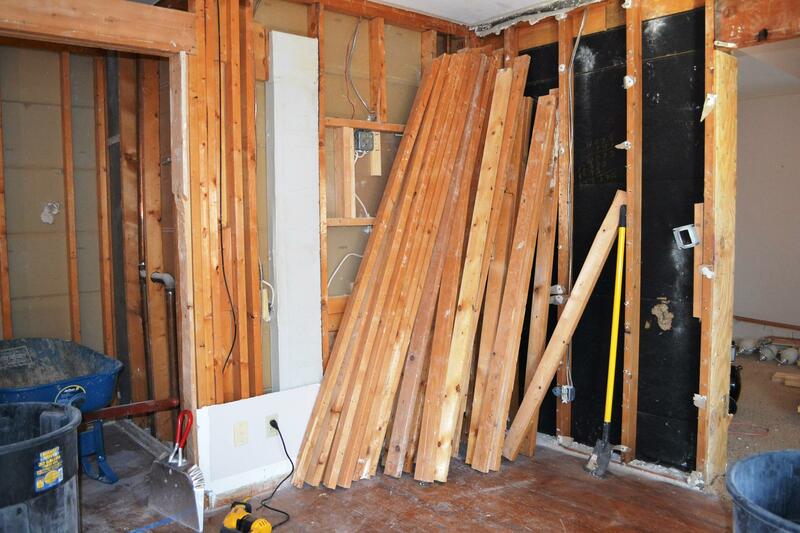 This renovation is finally starting to take shape. We can totally see a future in this space – laying in bed on a lazy Sunday morning, putting away laundry in our large walk-in closet, getting ready for a black tie event…and no, there isn’t a baby cradle. Next on the list: installing the load bearing beam and finishing up some little electric! You may have noticed our electrician (electric is something these DIYer’s don’t touch) has already had his hand in this space. His name is Bob and he thinks Michelle is crazy. I don’t think he has officially said the word, but I think “overkill” is what comes to mind every time he walks in our house. In my defense, I just want to cover all bases…Hopefully wiring will be finished sooner than later….his hourly rate is starting to add up!